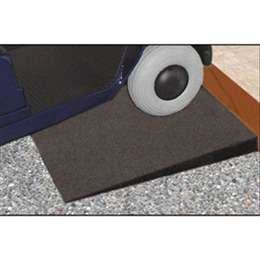 EZ-ACCESS Transitions Modular Entry Mat is designed for doorways and raised landings. This portable wheelchair ramp simply sits against the doorsill (inside or outside) to provide a smooth ground-to-sill transition and is especially practical for sliding glass doors because it does not interfere with the door track. Made of 100% recycled rubber. Can easily be trimmed for lower heights and widths to fit any entrance or threshold. Standard width is 48" (for wider entrances, simply place 2 ramps side-by-side). 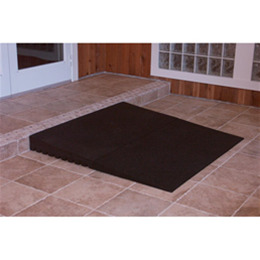 The Transitions Modular Entry Mat is ideal for indoor and outdoor use and because the ramp is fully portable, it provides the ability to move it to another door or location if desired. 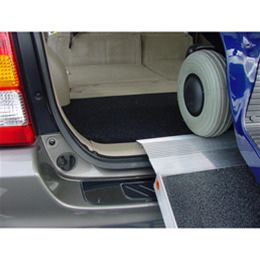 Optional pair of Rubber Risers can be combined with an additional Transitions Modular Entry Mat to create a maximum height of 4¾. Supports up to 850-pounds and features a 1-year limited warranty. Made in the USA.